Road Trip: New Zealand. Auckland. I’ve been in New Zealand for almost a whole day now: the whole thing seems a bit surreal. Maybe it’s because I’ve been thinking about this trip for months, maybe it’s because everyone speaks English, but it’s hard to wrap my head around the fact that I’m really here. I flew into Auckland from Tallahassee via DFW and LAX and I have one jet-lagged day here. I took the ferry to Waiheke Island and wandered the trails with my new friend Klaus, whom I met on the ferry. It’s a nice island–the sun came out while we were hiking, so it got progressively nicer. Klaus and I sat and had a coffee (I had a local beer) and chatted about life, etc. He was on a six month trip alone because his kids were old enough for him to do that (he has five–the youngest is 18). Very interesting fellow and a good introduction for me to the single-travelers code: if you want company, you’ll find it. If you don’t, company can still find you. I checked into the hostel (BASE Auckland) and headed out for some dinner. After a really good meal of arugula salad and Tortellini Porcini e Tartufo at Gusto Italiano (served by a Neopolitan), I wanted bed. Note about this particular hostel: even though it’s super convenient to get to and from the airport (it’s on the Airbus route, right on Queen Street), sometimes that’s not enough. The on-site bar and fliers for “jelly wrestling” in the hall should have tipped me off. But, it was a bed and I was there for less than 24 hours, so it all works out. 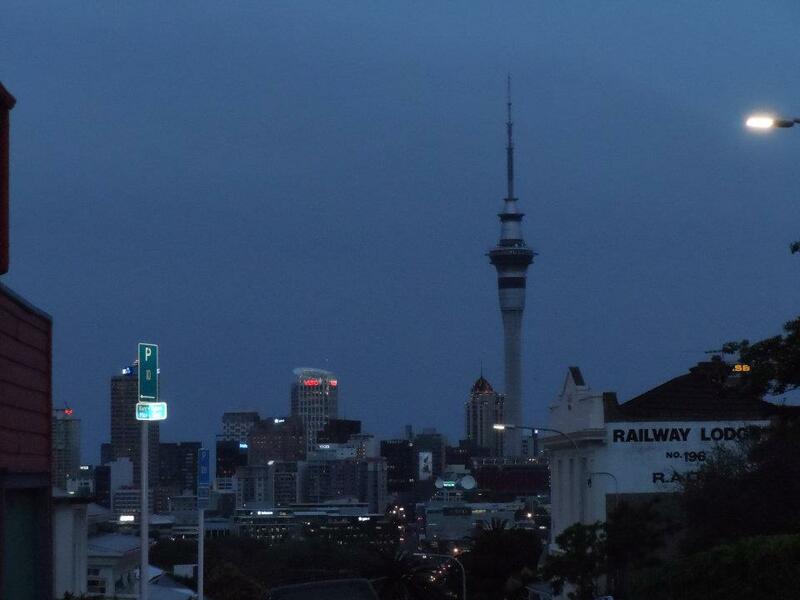 Auckland, from my perspective, is a lot like other big cities. It’s cleaner and easier to navigate, which I like (the bus system is really easy), but it feels like just about any other city. I’m ready to see more of the country. Airbus Express is a cheap and easy way to get into Auckland from the airport, with buses leaving every 10 minutes. For $26 NZD round-trip, this bus takes you to a few main stops in Auckland without a lot of stops in between. Check out the bus system: the City Link (a bright red bus) runs through the centre of the City and the developing Wynyard Quarter and is free. The Inner Link (a bright green bus) runs from the Britomart Train Station, out to Parnell, through Newmarket, along K’ Rd, Ponsonby Rd, past Victoria Park and then back to Britomart via SkyCity. There is a charge for this bus, but rides start at $1.80 NZD. The Outer Link (a bright amber bus) runs (as the name suggests) along the outer reaches of the city through Parnell, Newmarket, Balmoral and other neighborhoods. Unless you really want to pay $25 NZD for a ride and a view, don’t bother with Sky City’s Sky Tower. Tags: Auckland, base auckland, new zealand, waiheke island. Bookmark the permalink.